Whether you drool over their horsepower or decry their emissions, the car is an important and ubiquitous part of nearly all of our lives. And the history of their design and the innovations of their technologies can tell us a lot about how our values and attitudes have changed. 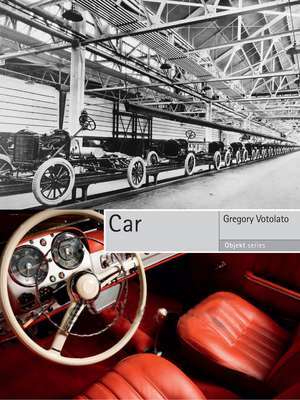 In this book, Gregory Votolato shows us how and why the automobile has become—since its rise in the late nineteenth century—at once an object of unparalleled popular desire and a hugely problematic emblem of the modern world. Votolato explores the ways that our love-hate relationship with the car has been intimately connected with car design. He tells the story of the rise of the private passenger car and all the psychological, social, and economic functions it has come to serve beyond mere transportation. Introducing readers to the automotive design process, he traces the lifecycle of the car from the drawing board to the scrapyard, offering insights from key figures in the industry, as well as a careful evaluation of the car’s enormous environmental impact. At the same time, he looks at the many cultures tied into the automobile, from drag racing and customizing to the luxury coachcraft of the classic era. Along the way, he takes us for a ride in some of the most famous cars ever to have had their tires inflated, from the Model T to the Tesla. The result is a top-down, thrilling burn through the history of one of our most beloved—and lamented—inventions. Gregory Votolato is a lecturer at the Victoria and Albert Museum and tutor in critical and historical studies in the vehicle design program at the Royal College of Art, both in London. He is the author of Transport Design and Ship, both also published by Reaktion Books.